I took a week off from work to move into our new house. It was a time of rest, and relaxation despite the chaos around what moving can bring. I’ve had a few personal projects on the back burner, but never seemed to have the time or the energy to make much progress. Recently a talk with a friend reminded me how important completing those pet projects can be for your personal happiness. I’m proud to present the completion of an idea I’ve had a for a while: Routastic. What is Routastic? 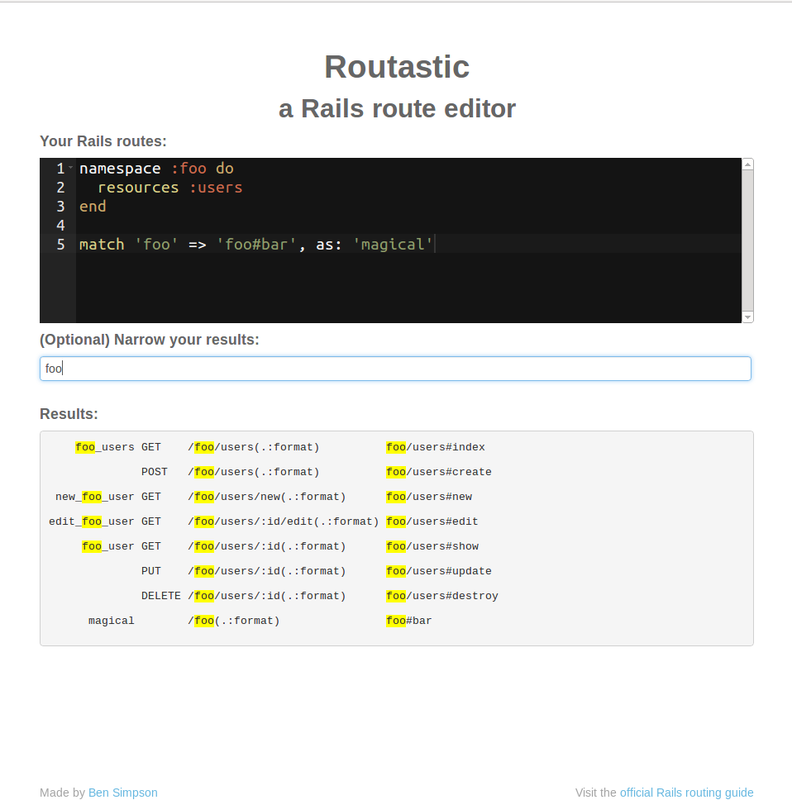 It serves as an interactive Rails routes editor. Simply, I got tired of the pattern of modifying config/routes.rb, then running rake routes and grepping for some result. This is completely inefficient. My inspiration came from the beautiful Rubular.com and its interactive regular expression building. Its quick. Its painless. Its a valuable tool for everyday programming. Please check out http://routastic.herokuapp.com/ and let me know how I can improve it.